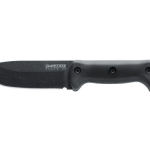 The Kabar Becker BK7 Combat Utility Fixed Blade Knife is my #1 Recommendation for a Tactical Knife! Many considerations come into play when making a decision to purchase the best tactical knife. The characteristics of the knife, general purpose of what it will be used for, price, and durability of the handle and blade are all important to make a poor choice when purchasing one. Tactical knives can be obtained just about anywhere. From flea markets, pawnshops, army surplus stores, hardware stores and the Internet, these knives are in constant supply while always being in high demand. It’s easiest to buy them online from Amazon.com in my experience. What are Tactical Knives used for? An all-purpose tactical knife is a great addition to people concerned with emergency preparedness issues. Outdoor enthusiasts from hunters to fishermen like to carry one to always have handy when needed. Some police jurisdictions allow swat team members to include them in their arsenals. Militaries worldwide issue them to soldiers as part of their standard protocols. First responders, emergency medical technicians and firefighters use them when needed in emergency response situations. From using tactical knives as weapons in combat, freeing trapped individuals from safety belts in car accidents, filleting fish or skinning deer, the use for tactical knives will always be there. Today’s world offers another new use for them as being an important tool in emergency preparedness kits and survivalists agenda. What are Qualities to look for in a Tactical Knife? The composition of the steel used in a knife is very important to durability. 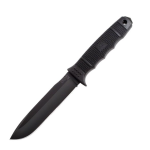 Tactical knives are made of both carbon steel and stainless steel. Knowing a little about each will help determine what decision is made when purchasing a knife. Stainless steel is less prone to rust than a carbon steel blade. Repetitive use of a stainless blade will dull the knife and require sharpening of the blade. Stainless steel blades are extremely hard to sharpen compared to carbon steel blades. Carbon blades can be sharpened easily and made to be as sharp as a razor. Carbon steel has the advantage of being tougher from abuse the knife might have to be used for. Carbon steel blades are considerably stronger with fewer chances of breakage under extreme heavy use from day to day requirements. Another important characteristic to look for in a blade’s edge in either type of steel is that the blade tip to base is one continuous edge. This makes the blade easier to sharpen over a blade that is serrated. There is another difference between the two blade edge types. A plain edge blade is great for hunting when skinning a deer. A serrated blade edge is generally more useful for cutting through small limbs for lean-to construction, firewood, rope or other tougher objects. Some tactical knives come in a combo edge for added versatility. Fifty percent of the blade from the tip back might be one single edge while the remainder of the blade is serrated. Overall, this makes little sense because the majority of blades on the market have 4 to 7-inch lengths that make the serrated area of the blade hardly useful. The tip of the blade is extremely important when it comes to survival situation usage. Clip point blade tips are formed with a slight curve of the top portion that makes them harder to break off. Drop point blades are designed with the dull side (top area) of the blade sloping downward at angles 50 percent halfway between the tip towards the base of the knife. Size, length, weight and safety are significant when it comes to choosing the right type of survival tactical knife. Ergonomically designed handles that make it easy for the user to have a firm grip on the knife without a chance of accidentally cutting a finger are very important safety features to consider. The type of steel used in the manufacturing of the blades can make a big difference in quality of the knife. Blade shape and design can play roles in what can be done with a particular design. Determining what purposes the knife will be used for is crucial in order to select which knife is best for individual needs. For those with needs for a tactical knife for camping, hiking, hunting, fishing or emergency preparedness issues, a reliable fixed blade design should sufficiently do the job. For others that need a knife for everyday chores around the house, maybe a foldable tactical knife design is the answer. The legality of carrying such a knife needs careful consideration and forethought as many jurisdictions have laws against carrying what they might deem as weapons around in public areas. Though most people don’t purchase tactical survival knives for this purpose, a few individuals seem to do it anyway. These are only recommendations to others on some of the best tactical knives on the market to consider before making the decision to purchase. No two knives are alike, and neither is the use for them. Consider these as examples of what type of tactical knife might be most valuable for use, whether it is in the emergency preparedness kit, hunting, fishing or job-related field. The Kabar Becker BK7 Combat Utility Fixed Blade Knife makes an ideal choice for people wanting a knife for a variety of uses. The knife itself is durable and can hold up under extreme conditions. The blade tip features the clip-point design with an edge angle of 20 degrees. The blade length from tip to base is seven inches. Overall length of the knife from tip to handle is approximately 12.75 inches. This knife is capable of downing small trees, skinning animals, cutting through rope with ease and a variety of other everyday tasks. 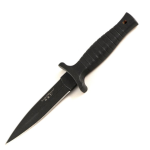 The knife is highly favored by outdoor enthusiasts and was designed for military personnel. The only drawback on the knife itself is the sheath design that is manufactured in China. Many owners of this tactical knife have purchased aftermarket sheaths or had them custom made to their preference. The knife is currently manufactured in the United States. The Fallkniven A-1 Swedish Survival Knife is another excellent choice in an all-round tactical knife. The 6.5-inch carbon steel blade holds a very sharp edge and can be easily sharpened. The blade can cut through wood with ease while maintaining sharpness. It features a finger guard for added safety and has a full tang blade extending through the handle for durability. The sheath material holds up well in moist conditions while offering a sleek look to the overall design of the tactical knife itself. More importantly, the handle features a lanyard hole and is ergonomically designed with the user in mind when it was crafted. 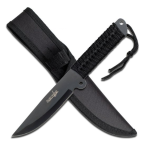 Last but not least, the SOG Seal Team Elite 7-Inch Survival Knife makes a great choice for those considering an elite knife for their survival tool kits The blade is partially serrated to make cutting jobs easier. 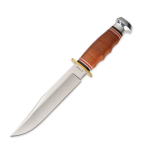 The overall length of this knife is 12.3 inches and features a spine rasp for notching. This knife is the meaning of tough with the abilities to be used for hammering and breaking glass. 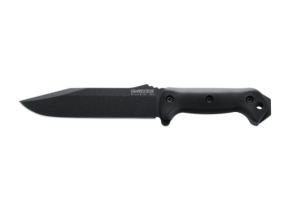 For added safety, this tactical knife features finger grooves on the handle for a better grip. The only drawbacks for this knife would be the sheath design. It seems to have a tight fit when the knife is in the sheath making it harder to remove than most people are comfortable with. Other than that, the Elite 7 is one of the best tactical knives on the market.